Thursday Aug. 12th. Linn always sleeps with me the night of my birthday so of course she did last night. When Nellie got up this morning she heard Linn talking in her sleep about the game of croquet we had last night. I went to market & out riding with Linn & Gracie C. after breakfast & then down town with May & Allie to get me some shoes. After dinner I practised, dressed myself & went down town to get my shoes. 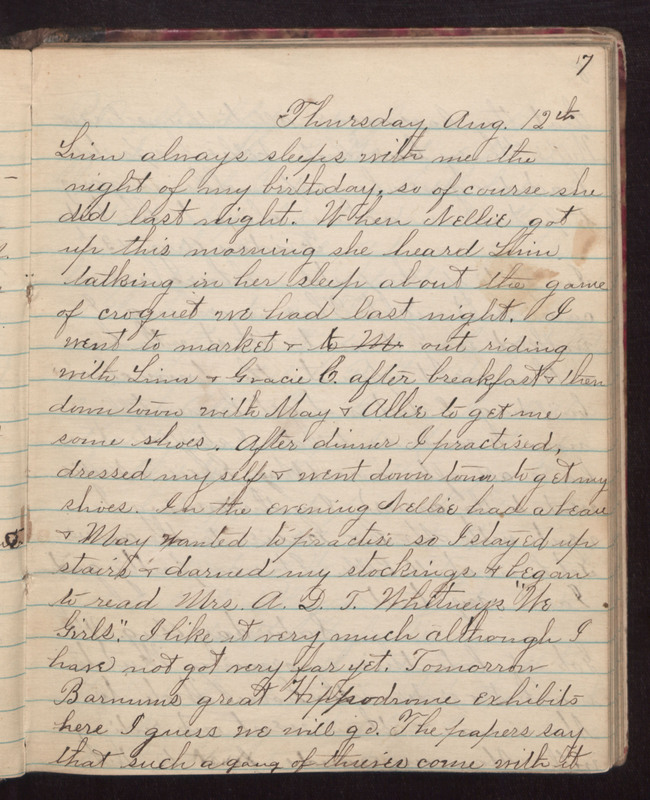 In the evening Nellie had a beau & May wanted to practice so I stayed upstairs & darned my stockings & began to read Mrs. A. D. T. Whitney's "We Girls." I like it very much although I have not got very far yet. Tomorrow Barnums great Hippodrome exhibits here. I guess we will go. The papers say that such a gang of thieves come with it.